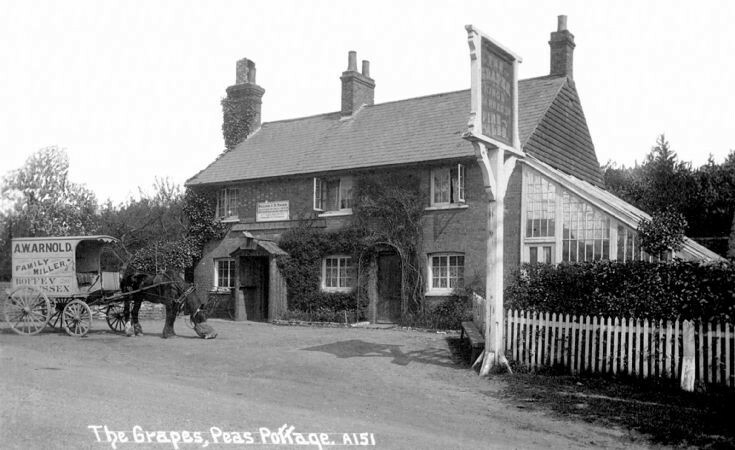 Lunch time at The Grapes, Pease Pottage and the van from A. W. Arnold, family miller, from Roffey is parked outside. The horse-drawn van has travelled about 5 miles to deliver flour, I presume to both bakers and the general public. The horse has a nosebag but I suspect the driver is having something more liquid. The sign informing the public of the licensee’s name is very large by today’s standard. It reads “William J. S. Thorn. Licensed to sell beer by retail to be drunk on the premises. Dealer in tobacco”. Fine grapes were grown in the large glasshouse attached to the south side of the building and led to the pub being so named. "Here is the home of champions" said Major Blackburn when he presented the championship league cup to Nelson Cook, captain of the The Grapes darts team, in 1938. Click on Open Document to view newspaper cutting.